weak for any severe weather threat. Concerns upon first glance for the setup. 2) Degree of convection in the warm sector and Gulf as there is currently a signal for this in guidance (including some influence from the sub-tropical jet). 3) How much the trough amplifies or deamplifies in subsequent iterations, this was a big issue with the last system that looked like it had potential to be significant in Dixie. Right now, heights over the warm sector look pretty decent and may suggest decent lapse rates assuming less convective contamination, but that could easily change. This isn't your classic scenario that you would assume to have major issues with Gulf coast convection given its latitude, but the active sub-tropical jet will likely throw some wrinkles into the potential. There also doesn't look like there will be a particularly strong WAA regime in advance of this trough, which can be key in the cold season (no "sacrificial lamb" to help with establishing moisture/warm air advection trajectories). I am actually also interested to see what happens to the second trough that looks to come onshore shortly after if this wave flattens a bit (i.e. becomes less significant). 00z CIPS analogs for the SE on Saturday had notable fall Dixie events (yielding several sig severe/tornado reports) in 4 out of the top 6 matches, including 11/24/2001 (#2) and 11/10/2002 (#3). Obviously an event of that magnitude is not expected, but if Gulf convection remains at a non-crippling level, there should be something with this type of trough orientation aloft and the strength of the wind fields. One issue could be that the bulk of the forcing for ascent may swing northeast if the trough matures too quickly. I looked at them last night, and was wowed at how many matched dates of big severe weather outbreaks. It’s something you can say that hasn’t been so strongly signaled on CIPS analogs with our other severe events this fall. 12Z NAM verbatim would be a respectable, if not particularly high-end severe threat over the lower MS valley on Friday. Possibly something on the order of the early November event. Hey Andy, why don't you share your thoughts on Americanwx as well? I always know it's going to be a quality analysis when I see a post with your Tuscaloosa couplet avatar next to it over there. 00z HRRR lights up the dryline with supercells tomorrow in OK and TX near/east of the I-35 corridor. Addendum: Strong cyclonic flow aloft remains over the SE all the way through Sunday and the front never gets shunted to the Gulf so plenty of instability remains. Going to need to watch that, any ripple in the flow could amplify the low level wind fields and set off new convection. This is not to discount Saturday's potential if adequate destabilization inland can take place. Tonight looks to be very active. with a more substantial severe threat expected to evolve after 01Z. * Effective this Friday afternoon from 520 PM until Midnight CST. Mid level lapse rate of 8.2 with special weather balloon launch at NWS Fort Worth. 6.7 in Little Rock, AR. Mesoscale analysis shows the very significant lapse rates all the way into southern MO. Dewpoints in the mid 60s, plenty of shear for storm organization, and rotation. It's going to be a long night. I'm glad it's Friday. The storm near Charleston, AR got tornado warned. It has a very interesting look. 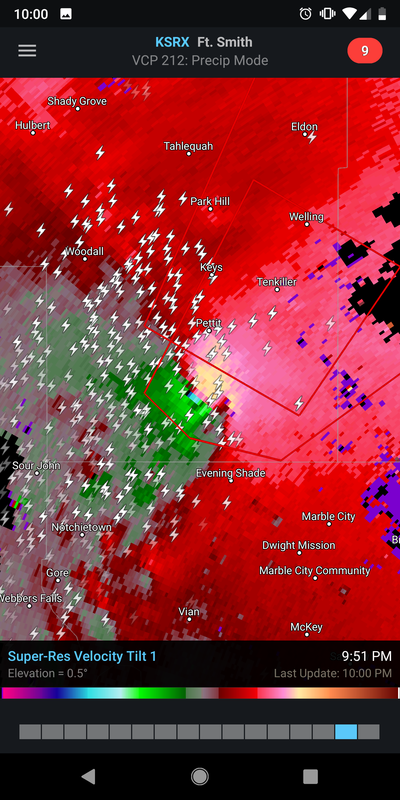 Nasty tornado warned storm west of Whitefield, and south of Porum, OK.
Wowzers! 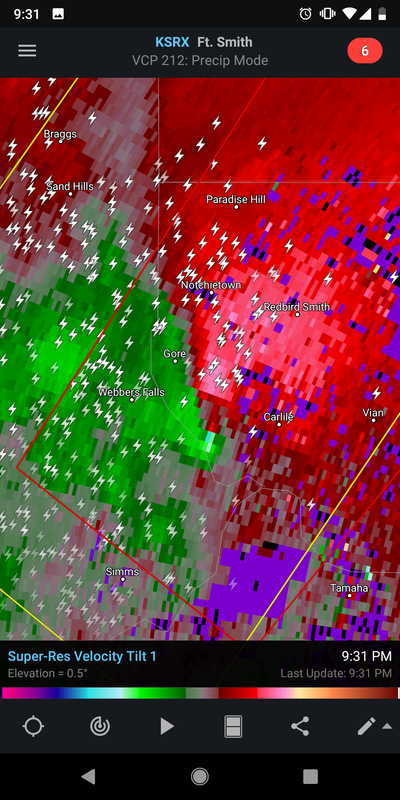 A large, and confirmed tornado now with that storm. Watch out Dry Creek, Pettit, Tenkiller, and Welling! This is a freaking animal! That thing grew into a monster!